Bald Eagle Inspection Services, LLC provides detailed and easy to understand reports helping you to understand all aspects of your mold problem. With nearly two decades of experience in the residential and commercial construction industry and many years dedicated to remediation and cleanup of commercial and residential buildings, you can be sure that your inspection report will be of the highest quality. Serving all areas of Upstate New York, including Saratoga Springs, Malta, Ballston Spa, Clifton Park, Rensselaer County and upper Albany County. Quality, complete and affordable mold assessments and mold inspections is my number one priority. I provide general mold assessments, mold assessments as a result of a home inspection discovery or real estate transaction, rental pre-move-in and pre-move-out mold inspections, commercial mold assessments and inspections, and mold assessments and inspections for insurance claims, losses and cleanups, indoor air quality testing and mold clearance inspections. I also specialize in tenant and landlord relationship and documenting when a mold problem exists in a rental situation and can be a valuable Expert Witness in the unfortunate event of litigation. 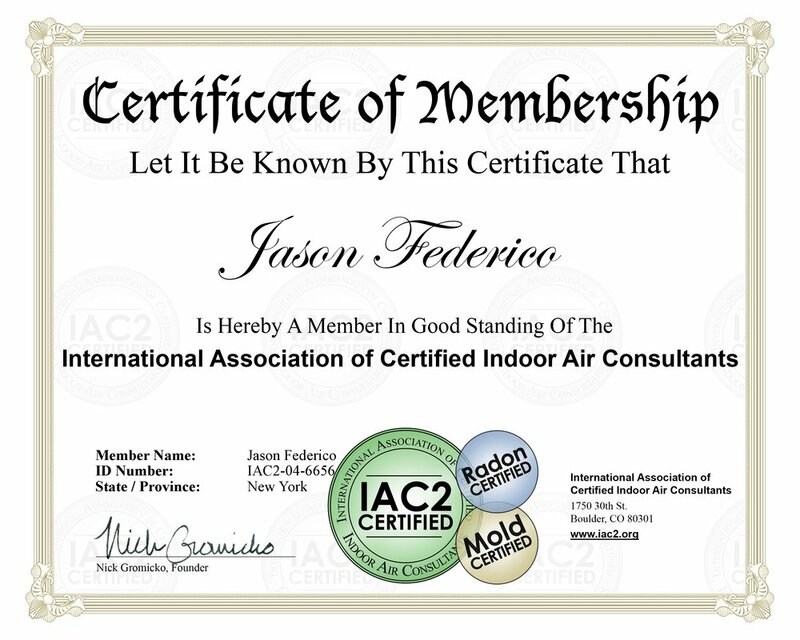 I provide high quality super accurate and sensitive indoor air quality testing. My equipment is fully digital, can be field calibrated, and does not require pre-test cleaning and therefore eliminates erroneous results. This equipment utilizes Air-O-Cell cassettes which trap mold spores and interior contaminates for lab testing under a microscope by a certified professional laboratory. Samples are shipped overnight and returned within (2) business days. I even have the ability to perform VOC testing. REVIEW: Client defined area is determined, attic, basement, general interior areas and/or whole home. CLIENT QUESTIONNAIRE: Information collected about the location of the mold, any recent water damage incurred, odors, visibility of mold and health symptoms experienced. INSPECTION: The client defined area is fully inspected for visual mold contamination. REVIEW OF WORKPLAN: Per New York State Article 32, "A mold remediation license holder who intends to perform mold remediation shall prepare a work plan providing instructions for the remediation efforts to be performed for the mold remediation project." This work plan is reviewed and approved or corrected as necessary to make sure mold remediation contractor is following the Mold Assessment Report. COORDINATION: Mold remediation contractor is coordinated with through the duration of the project and licenses are verified. Mold remediation contractor has completed all work as outlined in the approved work plan. Containment requirements have been properly implemented and maintained. CLEARANCE CERTIFICATE REPORT: Once clearance has been achieved, a final Clearance Certificate Report will be issued detailing the observations of the clearance inspection. Bald Eagle Inspection Services follows all New York State Article 32 protocol. To review a sample report, please click here. Please note, some report language is proprietary to Bald Eagle Inspection Services, LLC and has therefore been Redacted from the sample document. Click here to request your mold assessment now! Bald Eagle Inspection Services, LLC conducts a dual service inspection at the time of your residential home inspection, if the unfortunate condition of mold exists, saving you time and money. We also perform full service mold assessments apart from a residential home inspection. We are a NYS licensed Mold Assessor and include visual (intrusive and non-intrusive) inspections, lift, air and bulk sampling, and high quality mold assessment reports. We only utilize the highest quality and most accurate tools, sampling devices and laboratories. Protect your family's health by adding a mold assessment to any home inspection or schedule an inspection anytime you experience the unfortunate event of water damage or discover a mold-like substance in your residence. The key to a successful mold remediation is a quality mold assessor!